Explore our range of quality made-to-measure blinds, expertly fitted by our in-home experts. Explore the intoxicating Abigail Ahern collection. We challenged architectural designer and TV presenter, Charlie Luxton, to show us some inspiring ways to bring the coastal trend to his interior for summer. Vertical slats work well for large or unusual shaped windows and controlling light. Awkward window shape or size? Don't worry, our advisors will help you find a solution for any space. Real and Faux wood options for any space, including kitchens and bathrooms. Lightweight and easy to clean, great for controlling light and privacy. Reduce the amount of light coming in with specialist blackout fabrics and finishes. Matching to furniture or paint colours? See how colours and prints look in your own home. Our Pleated, Venetian and Roller blind designed to fit Velux® and Skylight windows. Roller blinds perfectly fitted to your skylight windows. Designed to sit inside your uPVC frames with no need for drilling. Our expert advisors will measure up and fit for you. Soft and delicate, perfect for filtering light and protecting privacy. A modern alternative to net curtains made of semi-sheer fabric. We'll bring our entire range to your appointment, so there's no need to decide now. Choose from a range of thermal fabrics to help reduce heat loss and lower bills. Pull up from the base or down from the top for flexible shading and privacy. A clever combination of two Pleated fabrics within one blind for maximum flexibility. We've got lots of inspirational ideas to help you choose the perfect styles and colours. Creating the right environment for a good night’s rest is really beneficial. Browse contemporary grey shades in our new Faux Wood blinds collection and find the perfect hue for your home. Read our top tips on finding the right blind for your window shape, whatever the style of your living room. 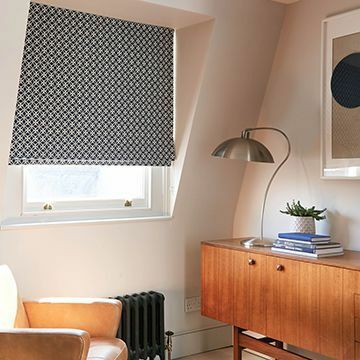 Get the look with geometric curtains & Roman blinds from our new collection. Browse our stunning range of fashion-forward geometric designs. Take a closer look at the ways you can use Roller blinds in your home. If you’re lucky enough to have a bay window in your room, we can help you dress this striking focal point. Here’s our rundown of the best options for humid conditions. Find out more about the different options for using Vertical blinds in a bay window. Here, we show you how to create a fabulous finish at your window with these contemporary and stylish window dressings. What are they, how do they work and why should you choose Roller blinds for your windows. For an elegant alternative to curtains, choose a blind with a sleek and coordinated finish for the same luxurious feel. Read our guide to Vertical blinds. We explain what Vertical blinds look like, which windows they’re best for and how they work.